There’s very little that’s more exciting in life than going to stay at a grand country house hotel – but if you’re a Londoner like me it always seems to mean travelling for hours out of town to get that essential combination of luxury, top-notch food and that all-important sense of getting away from it all. 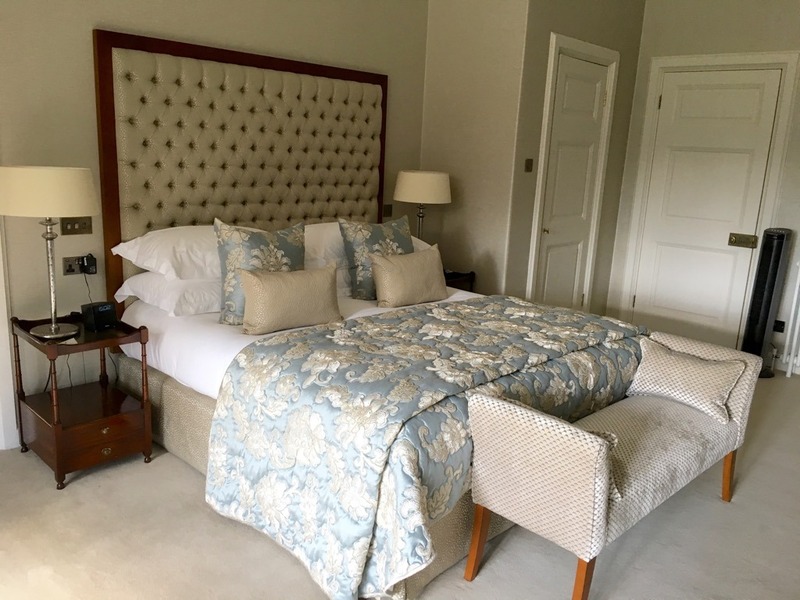 So I didn’t have to think twice when asked to review the brand-new State Suite at Tylney Hall Hotel and Gardens, a historic Grade II listed country house hotel dating back to 1700 with superb gardens and parkland that is only an hour’s drive from London and 5 minutes by cab from Basingstoke train station. Tylney Hall Hotel and Gardens is a 112-bedroom hotel set in 66 acres of grounds that is both a member of the Small Luxury Hotels consortium and part of the Elite Hotels group that includes Ashdown Park Hotel & Country Club, East Sussex, The Grand Hotel, Eastbourne and Luton Hoo Hotel, Golf & Spa, Bedfordshire. 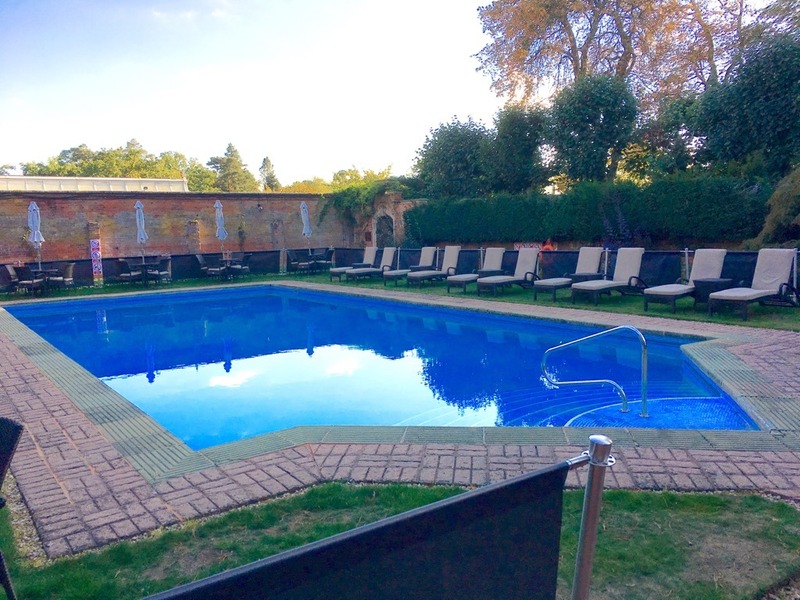 With a TripAdvisor Certificate of Excellence Award in 2016 and a slew of other awards, fine-dining in the 2-star AA Rosette Oak Room Restaurant alongside on-site wellness facilities and an impressive outdoor pool there was clearly going to be a lot to explore and experience. Climbing up the staircase from the charming walnut-panelled Great Hall it was clear that Tylney Hall Hotel has been beautifully restored with a respect for the integrity of the building’s architectural heritage and lacking the soulless corporate feel that can bedevil this type of operation. 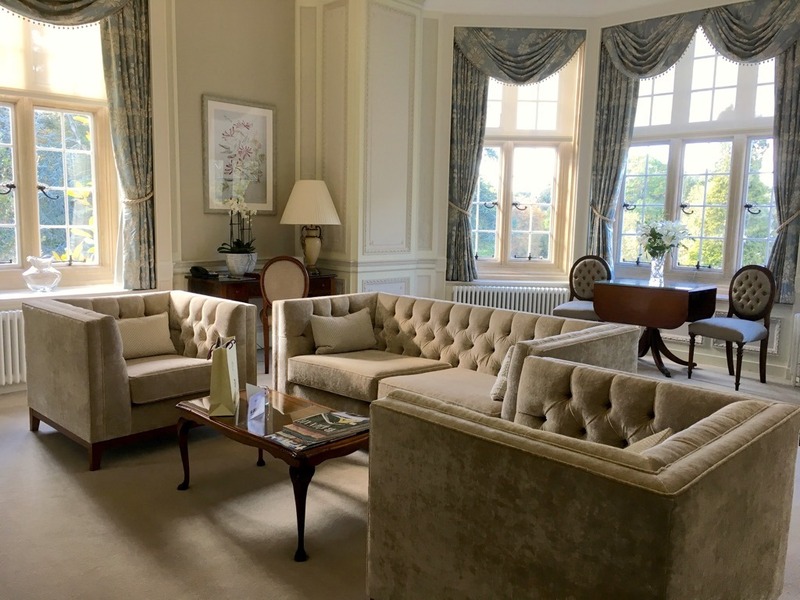 The State Suite’s official name is the Thomas Mugelston State Suite, after the eponymous founder of both Tylney Hall Hotel and the Elite Hotels Group. 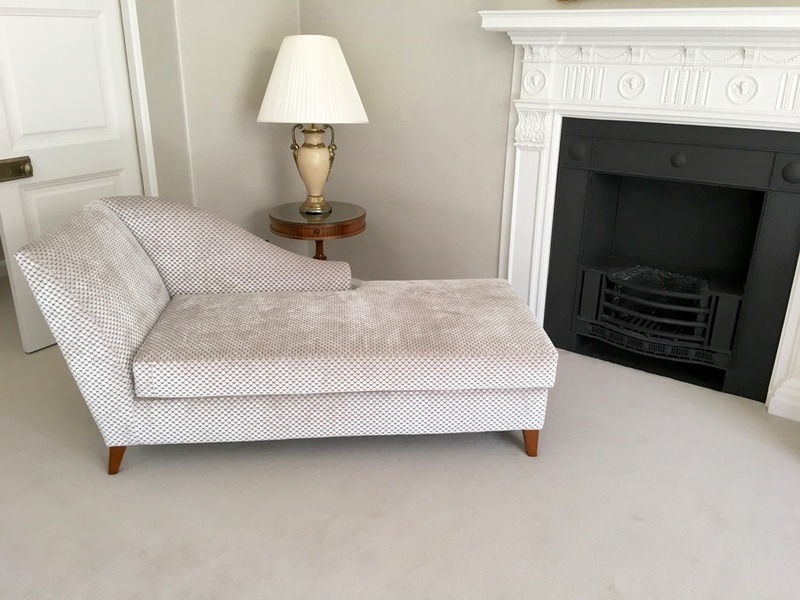 Rumour has it that Lady Florence Philips – the wife of former owner Sir Lionel Philips used the space as her boudoir. The first thing you see on walking in is the extremely elegant high-ceilinged lounge – I had to pinch myself – was it really a dream or did we really have this space to play with for 24 hours? 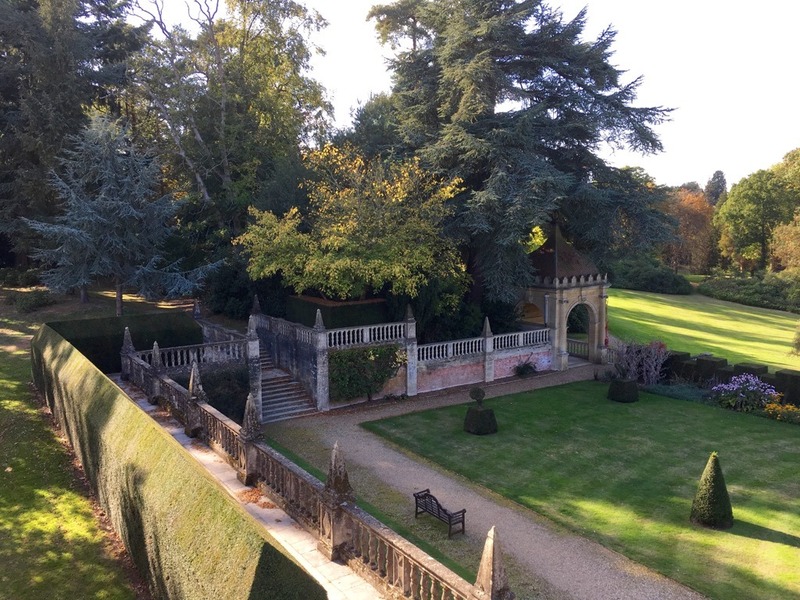 or maybe we should take tea and enjoy the view of the Italian Garden from our private balcony? The suite has some extraordinary views including a redwood-flanked vista – the longest uninterrupted view in Hampshire. After experiencing the State Suite it was time to investigate the rest of the hotel and the gardens. 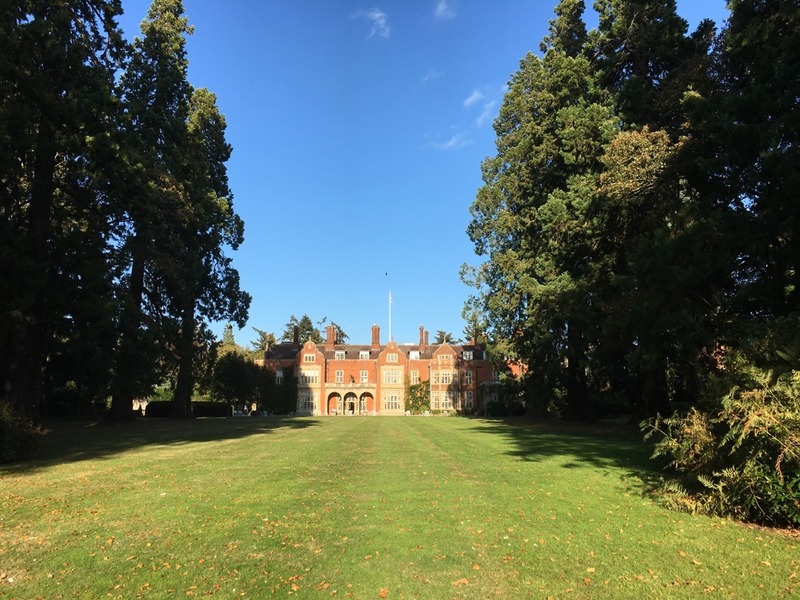 As well as having been a private home, Tylney Hall was also a hospital in World War 1, the headquarters of a shipping company and a school for miscreants owned by Brent Council. It became a hotel in 1985 building up a very successful function and event business. 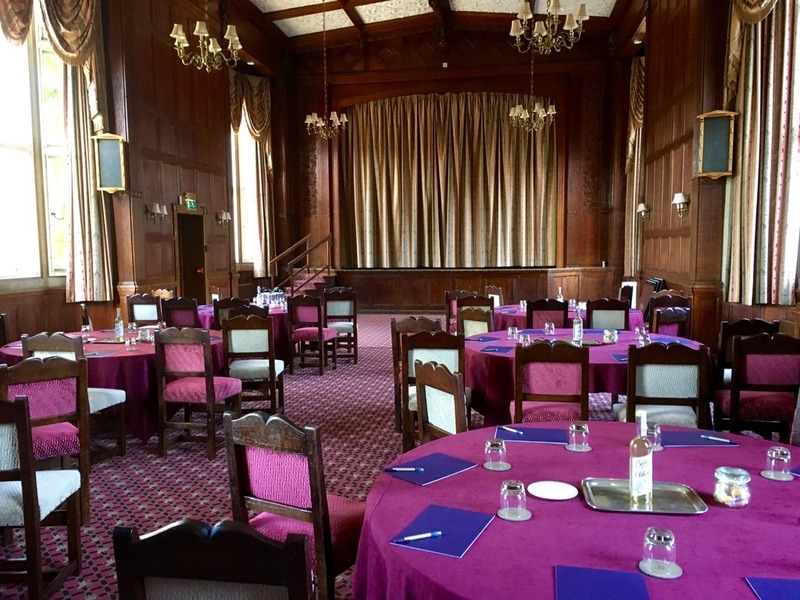 My favourite of the event spaces is the Tylney Suite, the old school Assembly Hall now used for musical soirées and the regular Sunday afternoon jazz tea. 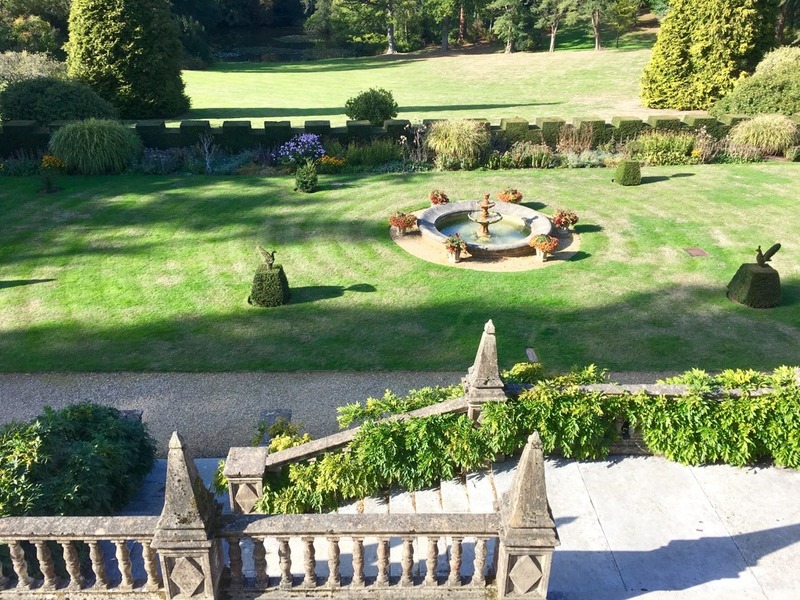 There is also the Newnham Suite that used to be the headmaster’s office which shares that ‘longest vista view in Hampshire’ – no misbehaving though! With these spaces as well as the beautiful gardens Tylney Hall really is a perfect venue for weddings and parties. But I prefer something a little more civilised! However in preparation for dinner we did get some exercise in with a swim (in October!) in the lovely outdoor pool which is kept at the delicious temperature of 25 degrees Celsius. 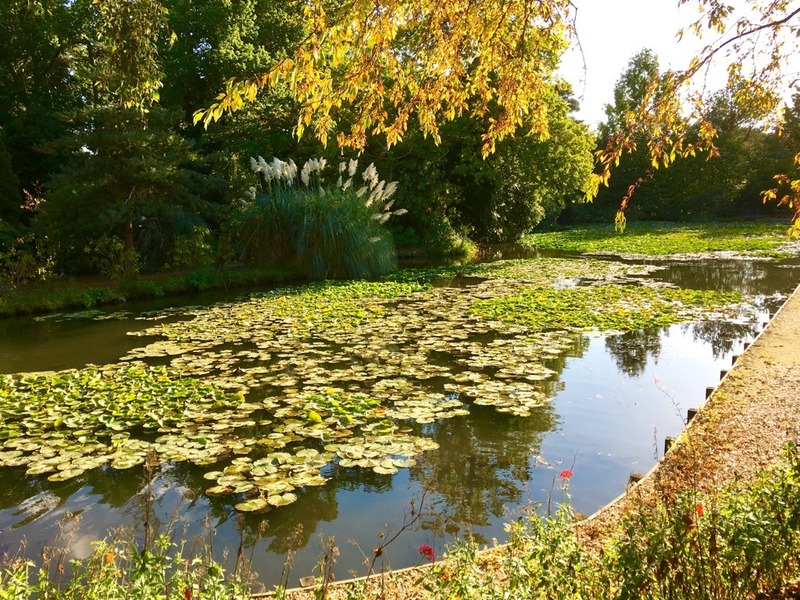 The gardens really are stunning with the formal Italian Garden from 1900 laid out by architect Selden Wornum, an impeccable formal Dutch garden and the impossibly romantic Gertrude Jekyll designed Water Garden with its cascade of lilies – move over Monet! 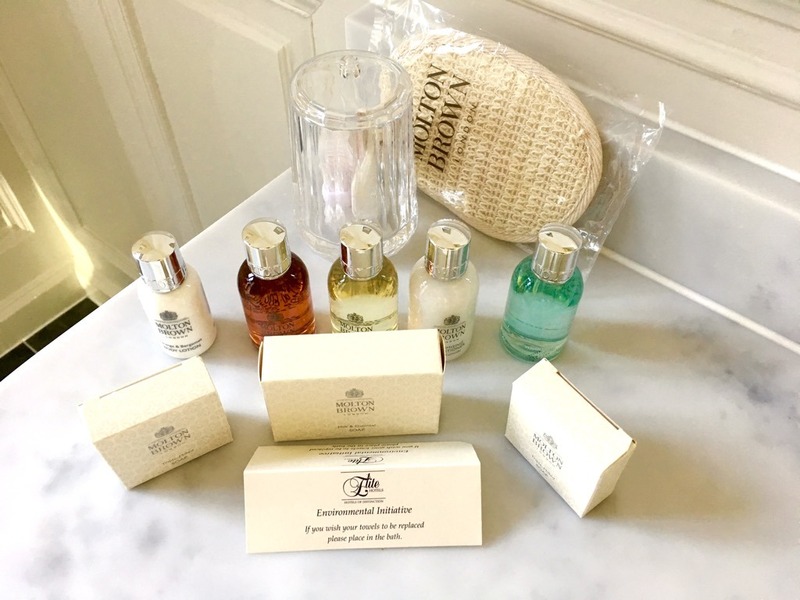 After our stroll and swim it was back to the State Suite for a relaxing ‘bath with a view’ and a chance to enjoy the supplied Molton Brown toiletries. 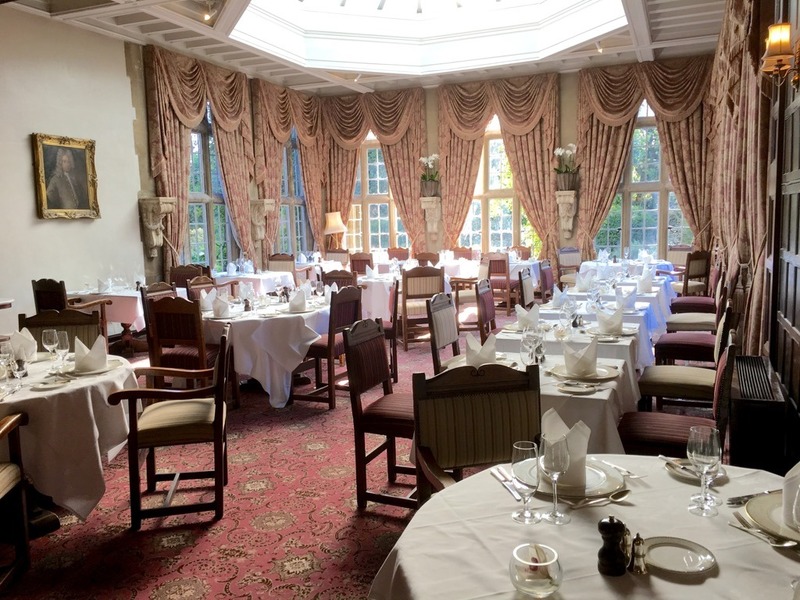 and then after a glass of fizz in the bar it was time for dinner in The Oak Room Restaurant. This was the original Smoking Room with evocative leather wall panelling and a great view of the gardens. Truffled scrambled duck egg on Nordic rye with shallot, chive, crème Fraiche and pickled mushrooms was a luxurious and rich plate of comfort food. 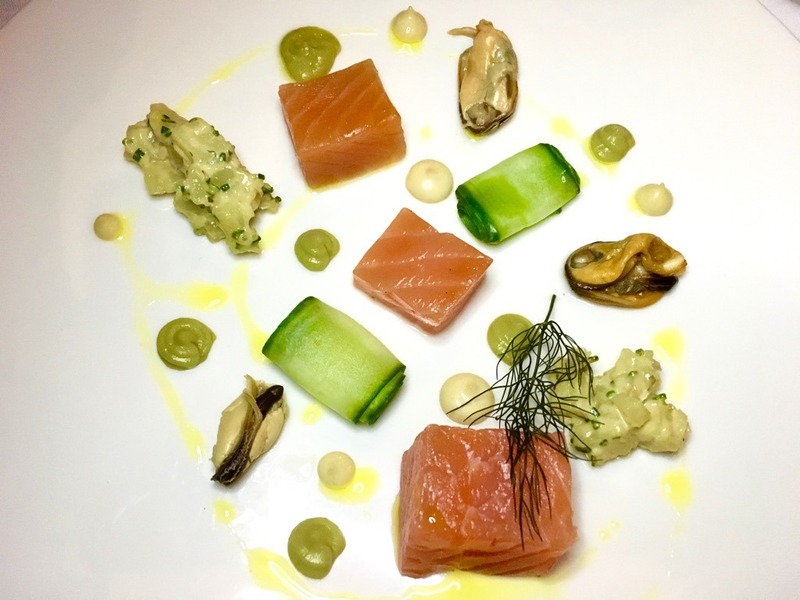 The prettiest dish of the evening was the beautifully put together plate of cured Scottish salmon, cucumber, avocado, Jersey Royals, and mussels – an assembly of great ingredients framing the richness of the salmon. It was the perfect match for our bottle of Condrieu, Etienne Guigal, 2013 from the Rhône and made from the Viognier grape, with its honeysuckle nose and full-bodied white peach flavour. Line-caught Dover Sole fillets were perfectly cooked with just a little resistance from the flesh, served in a lobster and olive sauce with caviar, sweetcorn, vanilla, and purple potato. 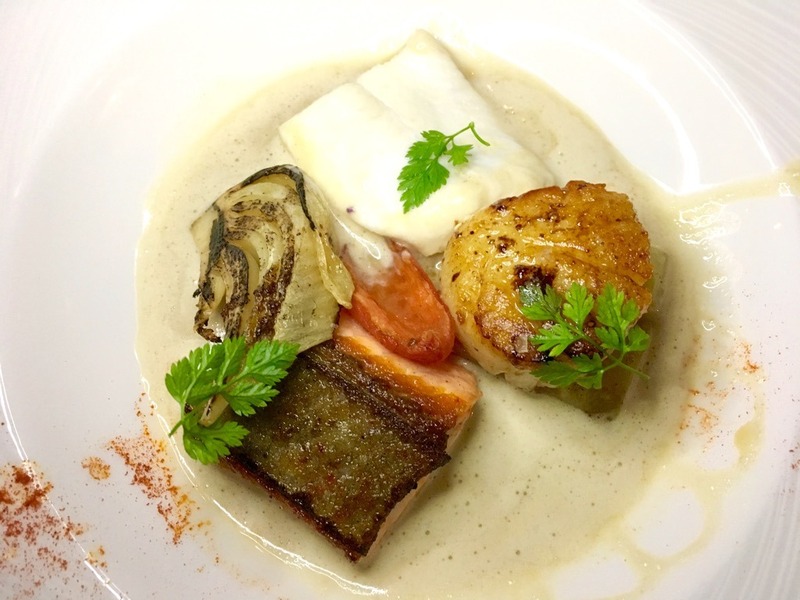 Continuing the luxe theme was a Trio of Seafood swimming in a creamed Cornish crab bisque with conﬁt potato and braised fennel. This was proper fine dining – great ingredients cooked immaculately and served with flair and originality. For dessert an intense blood orange sorbet with fresh fruit was a great palate cleanser and a Pimms and wild strawberry sorbet with meringue and Pimms jelly was a final taste of summer as autumn beckoned. After a great night’s sleep in the State Suite and a morning stroll through the grounds it was time for breakfast. With an extensive selection of fruit juices, cereals, fresh fruit and yoghurts, mufﬁns, croissants and pastries as well as platters of smoked salmon, meats and cheeses there was something for everyone. 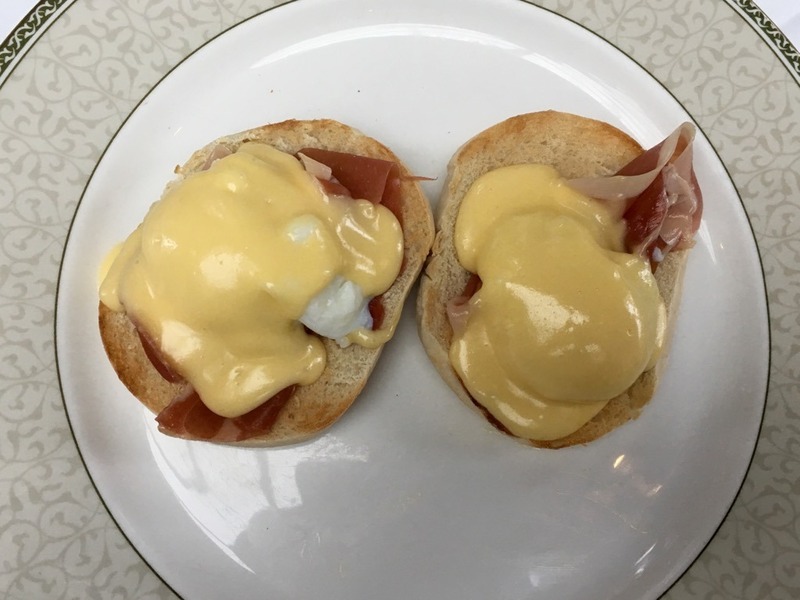 If you wanted something hot you could have a substantial looking Full English, porridge, grilled Scottish kippers, smoked haddock with poached egg or my choice of Eggs Benedict which had a particularly luscious hollandaise sauce. 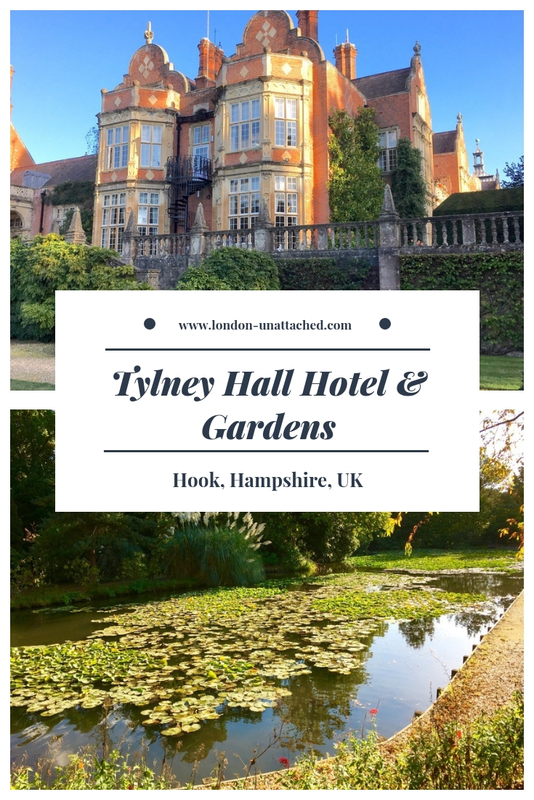 There is so much to see and enjoy at Tylney Hall that it’s as suitable for a more extended visit as it is for a brief staycation, though if you’re only there for a night as I was you might find it hard to leave! The State Suite is very special so if you want something out of the ordinary it’s really worth investigating. 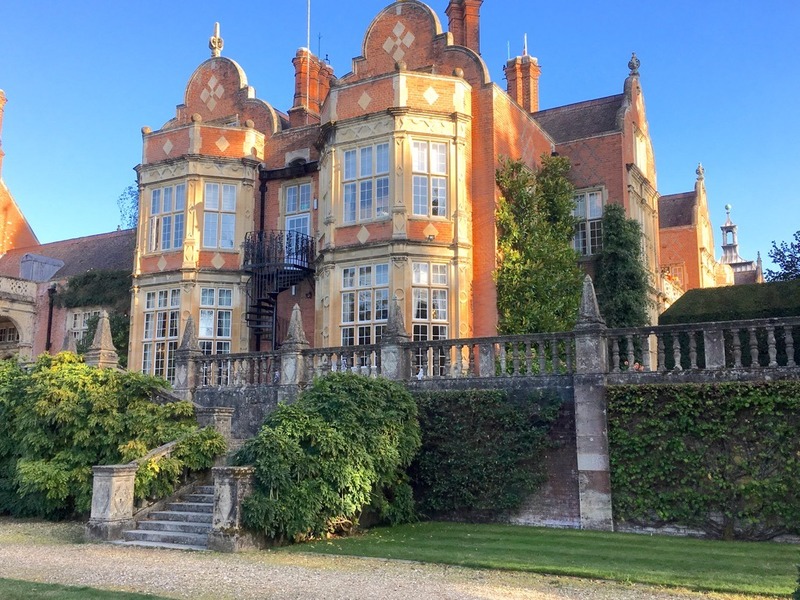 Butler breaks in the Thomas Mugleston State Suite at Tylney Hall Hotel & Gardens start from £850, including breakfast, a complimentary half bottle of Champagne, chocolates, fruit platter and complimentary soft drinks mini bar. 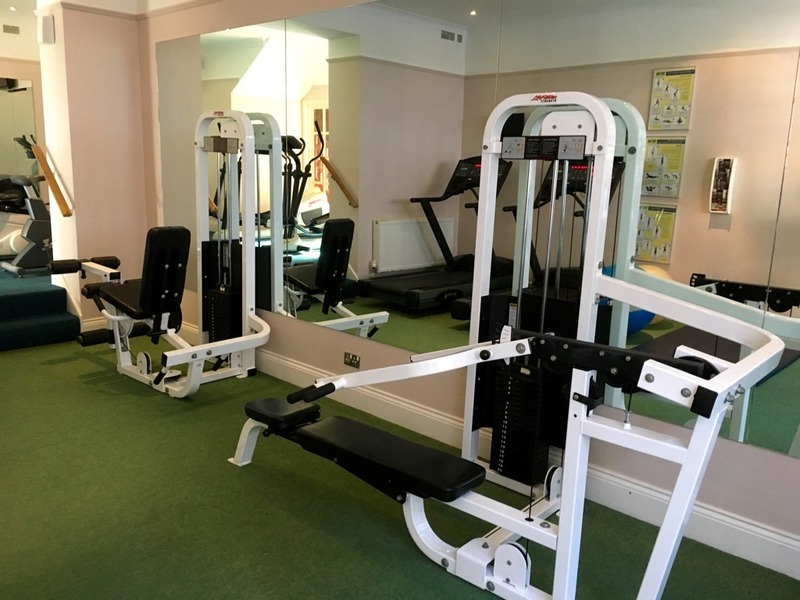 Tylney Hall is less than an hour and a half drive from central London or an hour from London Waterloo to Hook or Basingstoke in Hampshire by train. 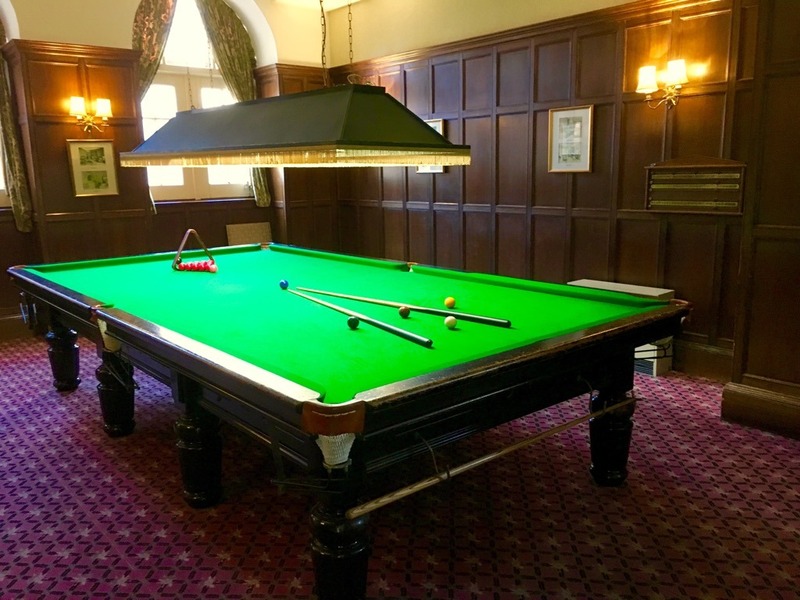 For more information and to book, visit www.tylneyhall.com or call 01256 745533. Disclosure: We were guests of Tylney Hall Hotel and Gardens but all content is editorially given. I was already sold after seeing how gorgeous the house is. But the Sunday afternoon jazz tea sounds fun and anytime a hotel offers eggs benedict for a breakfast choice, I can’t pass it up. That’s my vacation holiday breakfast indulgence! 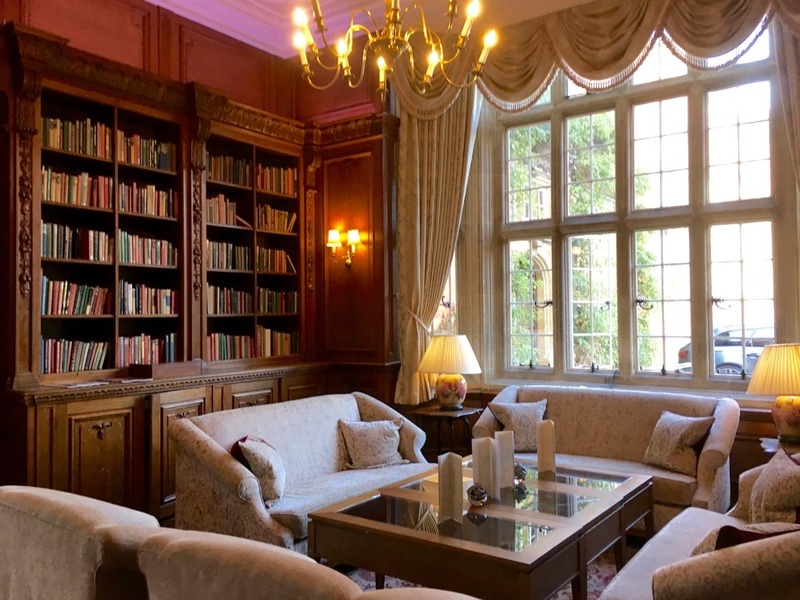 A stay at Tylney Hall looks like bliss! The free standing bath is worth it alone. Butler service would be a great treat for a birthday or celebration I think. The food looks really delightful, especially the Scottish salmon – so pretty! What a gorgeous place! I love English architecture. The view from the balcony is to die for! And can’t go wrong with a full English breakfast! 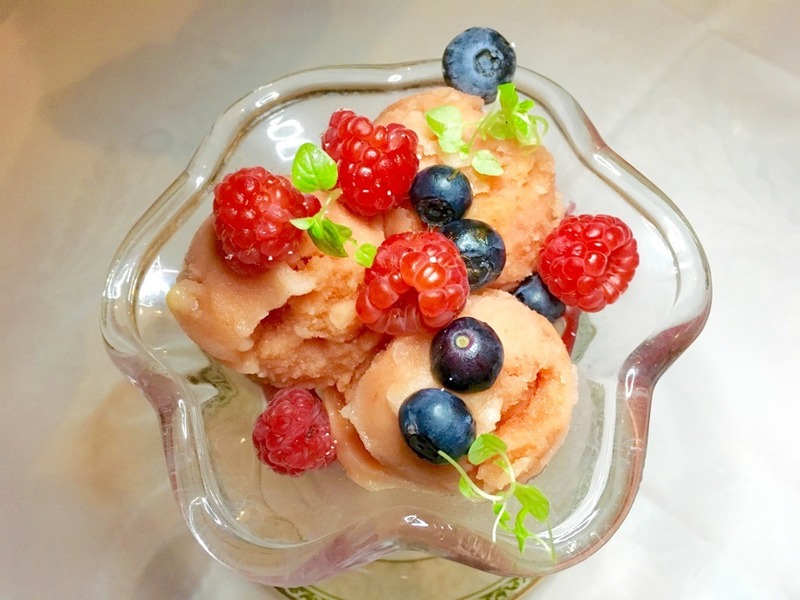 Did the orange sorbet taste as good as it looks? Yum, yum! What a divine experience, albeit for only one night. The stately Hotel has been restored with elegance. I love the staircase and the gorgeous suite. 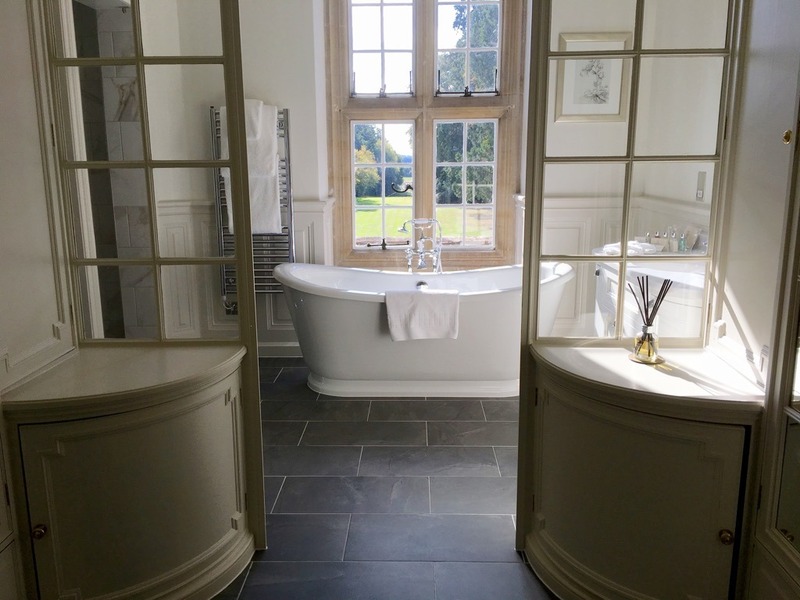 The bathtub and the views….wow! 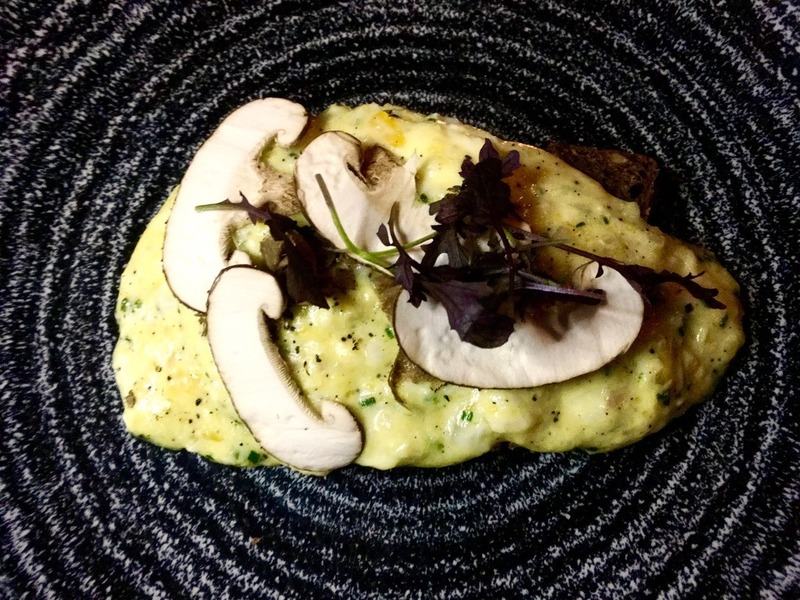 With such amazing food, like the truffled scrambled duck eggs, you are certainly in for a treat. Certainly worth the experience! Everything looks so fabulous from the front to the State Suite to the Oak Room Restaurant. Even the grounds…very English, if there’s such a description! 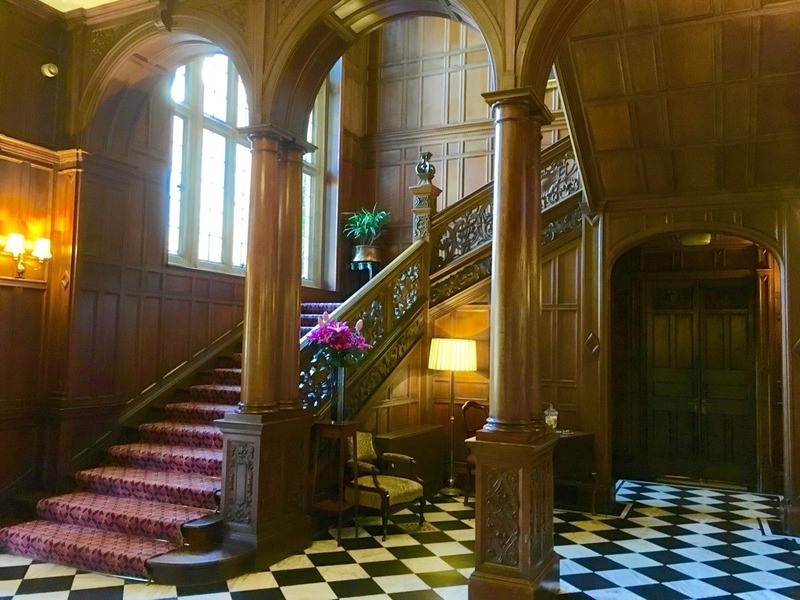 The Tylney Hall Hotel certainly looks like a grand country house. Glad to hear it did not have a soulless corporate feel. I just love when the tub has a view. It would definitely be good to have a list of whims to send your butler off to find. The food all looked delicious and pretty too! Certainly worth the drive from London. What a beautiful hotel. Love the view from that bathtub! Oh my gosh, that looks amazing. We’ve had afternoon tea there which was wonderful and I’ve always dreamed of staying overnight.